Today’s book review will cover Everest Pilgrim: A Solo Trek to Nepal’s Everest Base Camp and Beyond. The book was interesting from cover to cover and an easy read. It mostly covers a trek through the mountains of Nepal, but provides some useful information for someone looking to plan a trip. In addition to today’s review, there are many others so go ahead and check out all our book reviews. 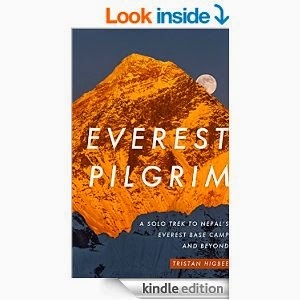 The front cover of Everest Pilgrim. Everest Pilgrim is approximately 151 pages and is only available in digital format at this time (I don’t think there will ever be a paper version). This book was written by Tristan Higbee and is available for $3.99; however, I was able to get the book free from Amazon during a sale. Higbee has published over 40 Kindle eBooks on various topics and runs a few different websites. Everest Pilgrim is a book about Higbee’s solo trek through the Himalayas in Nepal. It begins with the purchasing of gear in Nepal, describes the walk and scenery between each small mountain village, and an appendix covering most of the information needed to plan your own solo hike. The book provides good descriptions over the interesting places in Nepal that Higbee visited. Plus, this book is extremely inspirational, and makes me want to get out and go adventure. Straight from the author, “I loved my time spent hiking in Nepal’s Himalaya, but most of what I experienced can be experienced anywhere. Any mountains will do. Just go for it. If you don’t have mountains nearby, go out into whatever form nature takes in your area.” He is correct, we all need to just get out there and have fun. Another great aspect about this eBook is the color pictures. As a frequent reader of eBooks, pictures tend to be rare and I don’t think I’ve seen any others with color pictures. Moreover, the pictures are from some of the highest mountains in the world, which is truly awe inspiring. I would recommend this to anyone who needs an inspirational adventure story or for those interested in a trek through the Himalayans. However, I feel most people would find this an interesting read. While I find the book to be a little expensive, I’d say go ahead and read it (If the price ever drops to $1.99 or below it is a must read). What inspirational book did you read most recently? If you like the blog, go ahead and follow us on Facebook. Doesn't a pilgrimage imply that there is travel before arriving at the destination? From what you described, it seems he really does describe a pilgrimage to Mt. Everest. I agree that he did take a pilgrimage to Everest, but I find it just a little misleading because he didn't actually climb Mt Everest. Nor was Mt Everest the final destination of the pilgrimage.